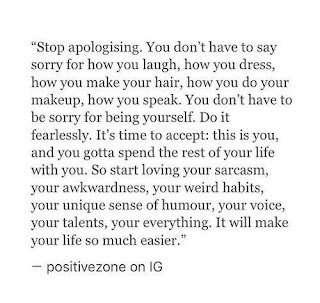 Stop apologising. You don't have to say sorry for how you laugh, how you dress, how you make your hair, how you do your makeup, how you speak. 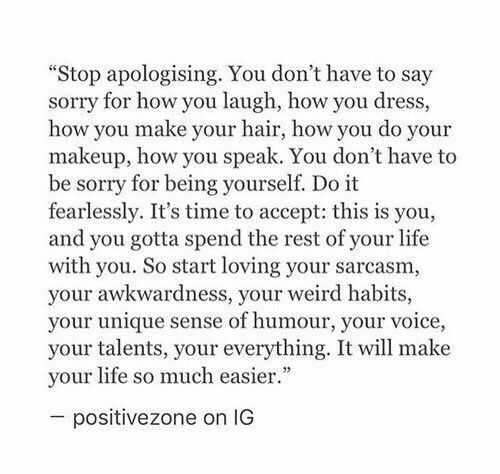 You don't have to be sorry for being yourself. Do it fearlessly. It's time to accept : this is you, and you got to spend the rest of your life with you. So start loving your sarcasm, your awkwardness, your weird habits, your unique sense of humour, your voice, your talents, your everything. It will make your life so much easier.